Air Lift Air Springs for the 2011 Chevy Silverado 1500 with the Z-71 Off-Road Package, adding the adjustable air suspension system to the Chevy is in order to compensate for a slightly lower rear after installing the ReadyLift leveling kit and a custom fiberglass canopy. We also want the adjustability of the Air Lift adjustable air suspension system to aid in keeping the truck level when towing or adding cargo to the bed. After installing the ReadyLift Leveling Kit and when towing the boat, the Air Lift Air Springs are just what the Silverado needed to keep her running level. One of the advantages of the Adjustable Load Support of the Air Lift Air Springs is found when keeping the new HID headlights pointing down the road and not up into the eyes of oncoming traffic. I'm sure everyone we come across will appreciate the fact we installed these on our new Chevy Silverado. 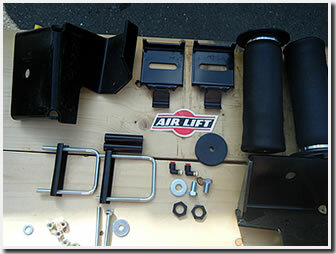 Read about the installation of the Air Lift Adjustable Air Springs below. Choosing the Air Lift Air Suspension to complete the duties of controlling rear end sag, we now look at where to purchase these online. Shipping is a problem now that we are back in Alaska. We need to order this system along with the Bushwacker Extend-a-Fender flares but were running into the problem of companies that won't ship to Alaska. We ended up purchasing the Air Lift System from Auto Parts Warehouse but the Bushwacker Extend-a-Fenders were ordered from our local auto parts store. What's in the box: Everything needed for installing these units on the Chevy from brackets to air lines and fittings. We did need to pick up a 9/16 drill to relocate one hole in the frame. Installation: Installation was pretty straight forward with just a couple of little hitches that needed to be overcome. First the holes in the frame where the brackets installed did not line up. These were relocated using a 9/16 inch bit and then the bed frame rails needed to be notched (1) to allow the brackets to be installed in the correct location. 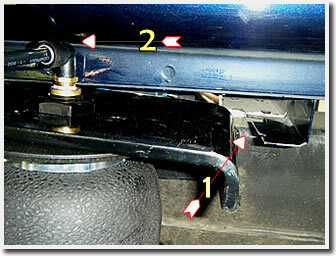 Finally, the air fittings were rubbing against the bottom of the bed (2) . 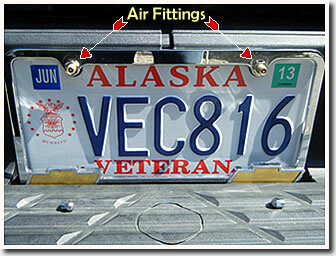 The air fittings were installed in the license plate frames to make the installation neat and clean. To fix the problem with the clearances above the air fittings, a 1/2" plate shim was machined to lower the brackets and we changed out the air fittings with some stainless ones that were available from our local machinist for a custom paint ball gun he makes. Clearances were now acceptable but one of the airbags was loosing air when left overnight. Air pressure dropped from 31 psi the night before to 0 psi at around 9AM this morning; a period of 13 hours passed between readings. 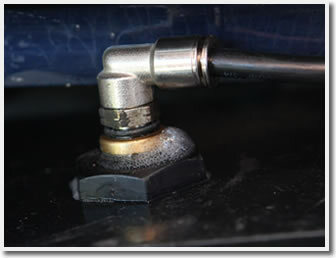 A little soapy water revealed a leak around the brass fitting where it is bonded to the air bag itself. As it is Sunday, August 28, 2011, and most all online business customer service departments are closed for the day, we will contact AirLift tomorrow and see about expediting a replacement bag to us here in the little town of Kenai Alaska. This should be a good test of their Lifetime Limited Warranty and a true test of their customer services as well. Stop by and see how this turns out but my guess from what I read is the part will be in the mail by closing time tomorrow. Update, November 28, 2011: Weeks of testing in sub-zero temperatures and the Air Lift Air Suspension on our 2011 Chevy Silverado is performing flawlessly. We were really wondering what effects we would notice during the frigid Alaska winters but were here to say it's been as low as –15° this November and the Air Lift Air Suspension has been up to every task we have demanded of them.